I stopped shopping at River Island when they decided to stick their logo on everything and the entire shop was glaring back at me with neon and sequins. 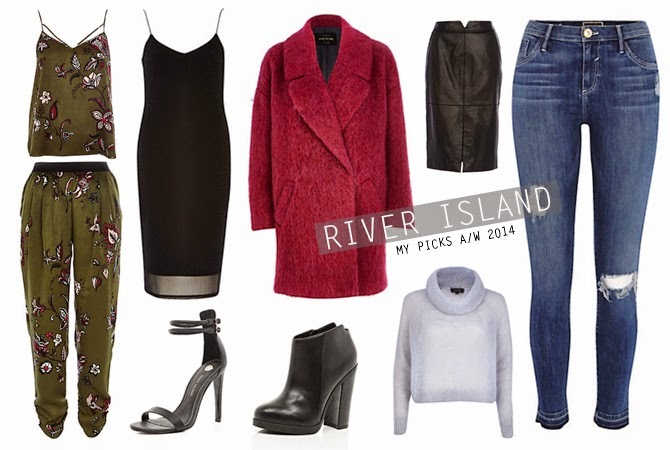 But River Island has done a 360 turn around and season after season, I find them getting stronger and stronger. They definitely have a strong game this season and if you've picked up this months Elle magazine (UK), you can get a 20% discount! Definitely time to stock up my Autumn gear. The coat, a must for any wannabe pimp. Great picks! Love the coat. Oh my gosh that dress and those shoes.. :O WantWantWant! I'm really into khaki at the moment, love the cami and joggers.